Seasons Greetings, friends and new friends! If you’re joining me after visiting Up to Date Interiors (I love Kathy’s decor style and her chinoiserie elements in her decor), welcome! Grab a cup of coffee, tea or whatever you’d like and let’s look at pretty sparkly things. 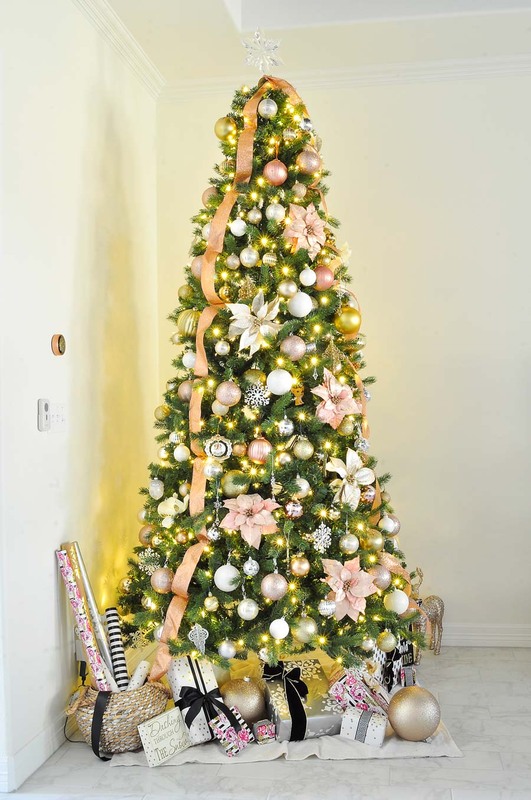 I’d like to thank my friend Stephanie from Casa Watkins Living for hosting the annual My Home Style: Christmas Tree Edition blog hop. 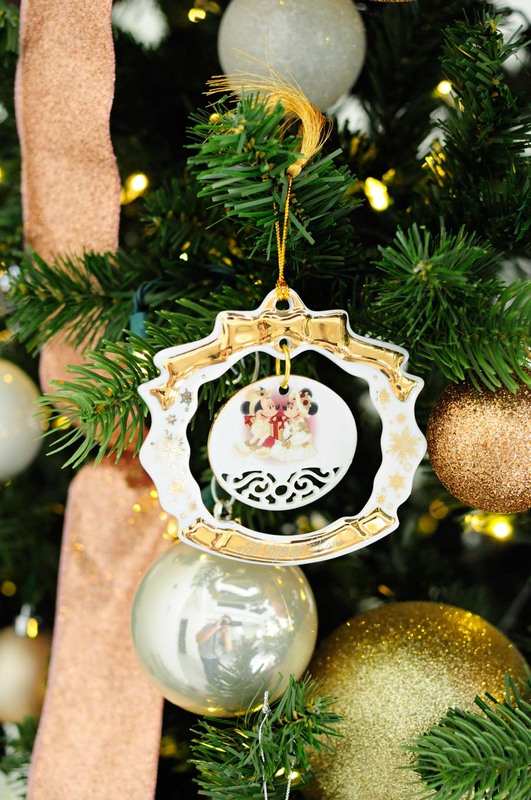 This is my second year participating, and I enjoy this particular blog hop because we get to really dig deep and show off our Christmas tree decor styles. I spend the most time on my tree in terms of decor in my home, so it’s nice to give it the attention it deserves. 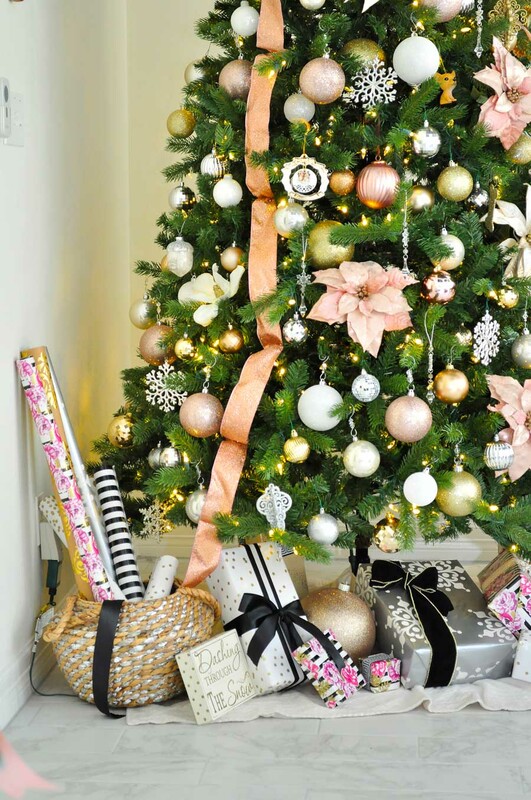 I narrowed down my Christmas tree style to three words: floral, glam & classic. I love, love, love florals, so I used them extensively on my tree and in my holiday decor in general (I’ll be sharing the full tour with you on Wednesday). I love the color and texture they add to a tree. For the past few years I’ve done a variation of black, white and gold, which is a classic color palette to me, so this year I swapped the black for blush. This adds a dash of girly glam, and I tend to skew a bit feminine in my decor choices much to the chagrin of my poor husband. I love using disco ball ornaments because they bounce the light around and are a dash of kitschy. I don’t really add too many “personal” ornaments, but this year there are two. One is an ode to my dog Pee Wee. This seriously looks like a miniature version of him. And this one from Disney World when we went in 2008 right before we got married usually makes an appearance. So, overall my ornaments were primarily blush, white/pearl, gold, and silver. A few acrylic crystals are scattered in between and two long strands of blush glitter ribbon frame the sides. I carry the theme down to the presents underneath the tree, and here’s where I added in a dash of classic black and white. You can never go wrong with black and white. And at night, the tree simply sparkles. I’ll be sad to take all this down in a few weeks, so for now I enjoy it daily with a cup of tea on my couch. This may be my favorite tree ever that we’ve had… it also helps that we upgraded from a 7′ tree to a 9′ tree for the new house. 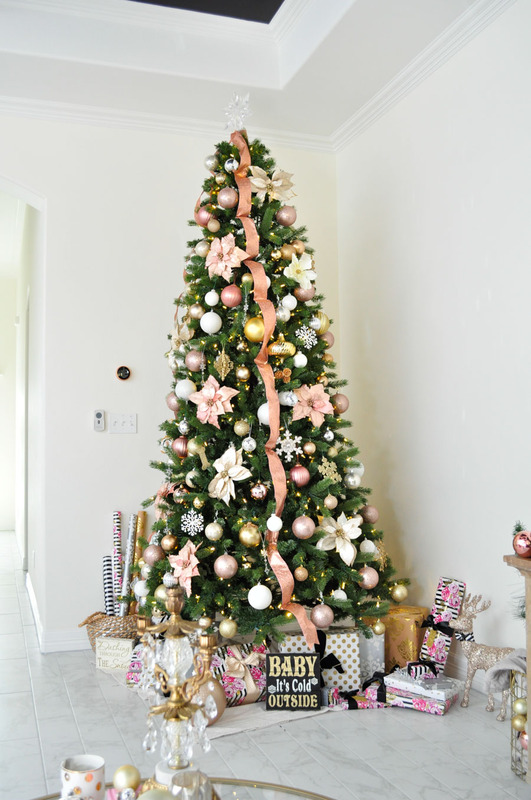 I truly hope you’ve enjoyed looking at my millennial pink inspired Christmas tree decor. I tend to embrace breaking from the norms of traditional decor colors, however, I do try to sneak in some classic elements done in with a twist. I’m now handing you off to the lovely Stephanie at Casa Watkins Living to see her fab take on a bohemian style tree. It is so unique and I love it! 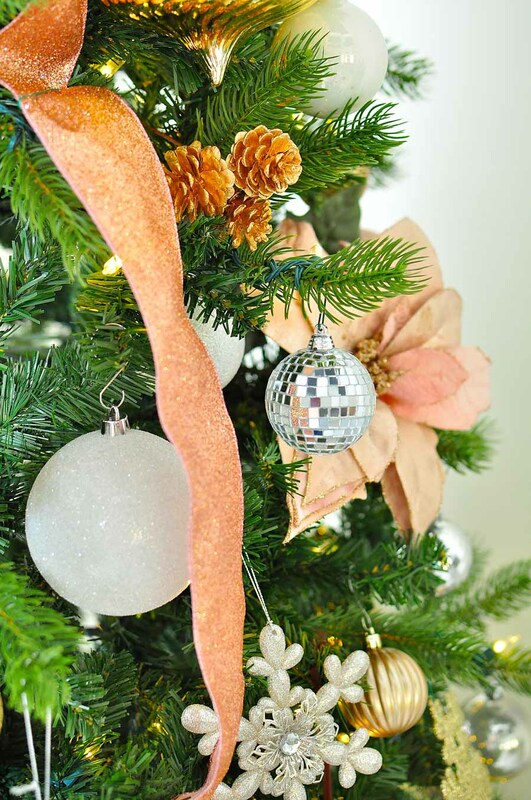 There’s bloggers sharing trees all week long, so even if it’s too late to inspire your decor choices for this year, maybe you’ll get inspired to start planning for your 2018 holidays (then you can scout the holiday clearance in a few weeks!) Cheers to a merry and safe holiday season for all of us! So gorgeous Monica!!!! 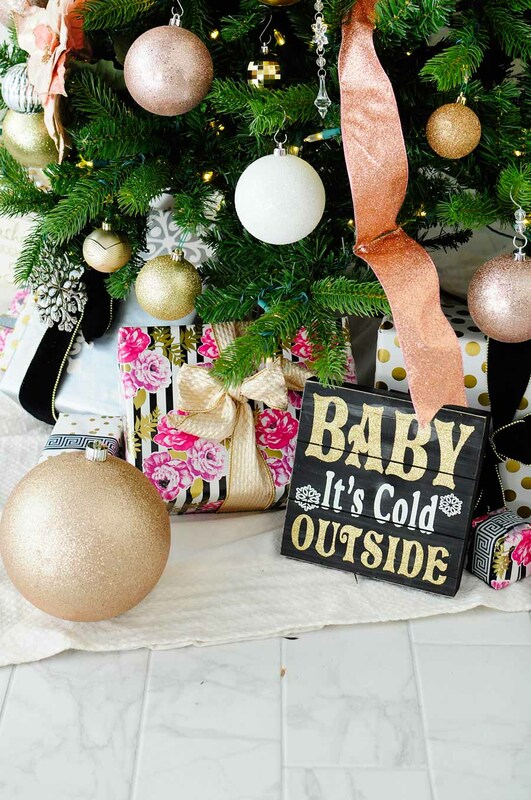 I adore the pops of pink and the little Pee Wee ornament is super cute! So glam and beautiful Monica. Hi Monica! This tree is absolutely STUNNING! It's such a beautiful tree, the colors are so soft and pretty! Beautiful, Monica! I absolutely love the florals and the pops of pink!!! Very pretty! The picture at night with all the lights — GORGEOUS! I love the colors you used. So pretty and warm! What a stunning tree! The addition of the pink flowers might be my favorite part! Have a happy holiday season! 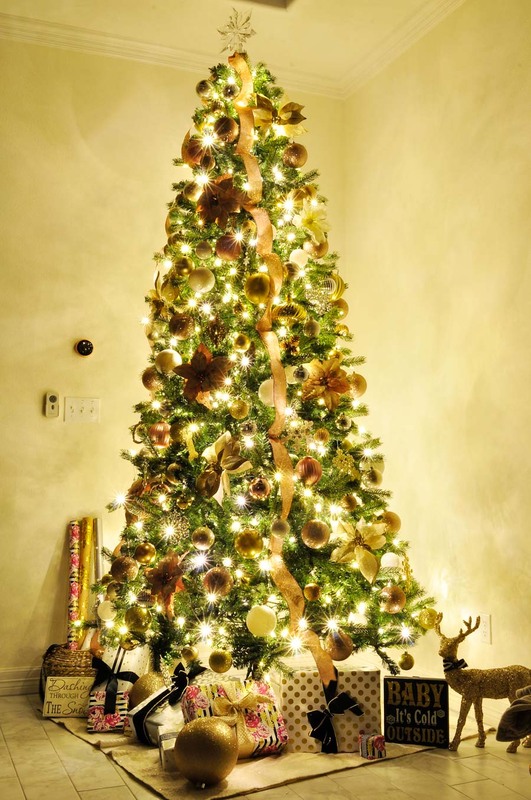 This is exactly how beautiful I wish my tree turned out! Haha. 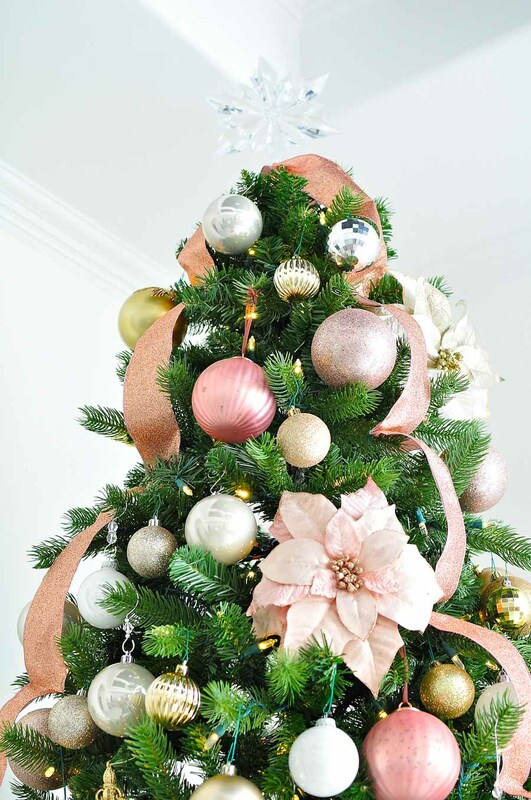 Love the balance of ornaments and the colors are dreamy. Thanks for your kind words, Heather! Wow! 9 feet of gorgeousness! 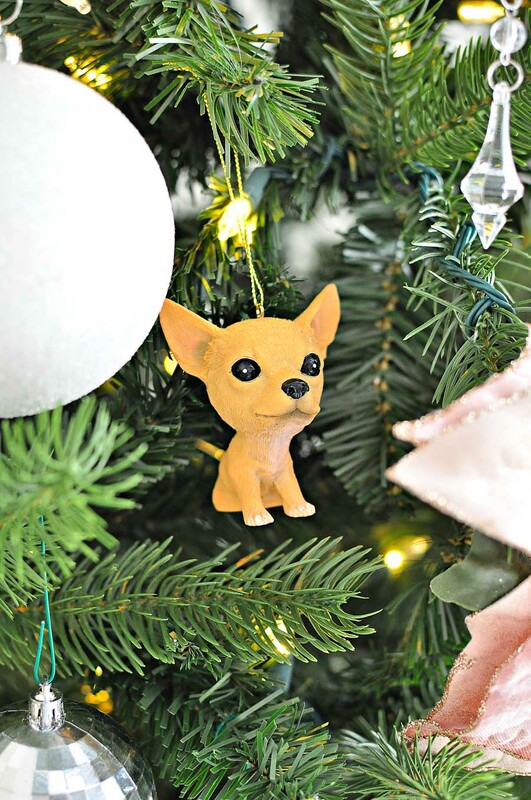 Love little Pee Wee and all your gift wrapping and decor around the tree. Your ornaments looks lovely. 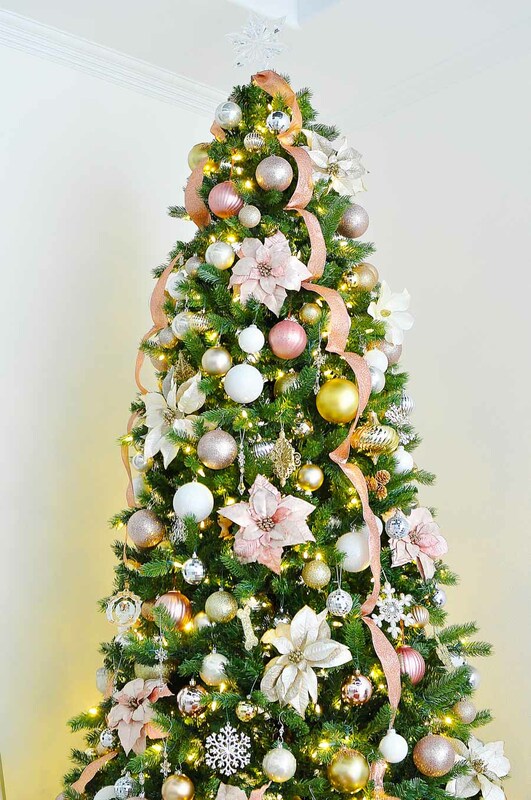 Love your tree Monica, the pink is so pretty and the addition of the poinsettias is such a lovely idea.